Install of the Month: Bella Turf and Greens Inc. Throughout the state of California, many golf-loving homeowners are finding backyard putting green installations to be the perfect alternative in their backyards. Paired with a synthetic lawn, residents have never been happier to have a fun, low-maintenance personal oasis. Bella Turf and Greens recently installed 1,500 square feet of Diamond Pro Fescue and Nylon Putt 2-Tone at a home in Tracy, CA. Both types of turf aim to mimic a natural lawn as much as possible and features dual colored blades of field green and olive green. Diamond Pro Fescue is designed to last for decades and is one of the more popular products due to its durability and its ability to handle heavy foot traffic. Nylon Putt 2-Tone, on the other hand, is designed to replicate a professional putting green. The homeowners of the featured backyard wanted to replace their dirt and rock-filled backyard with something that was low-maintenance and relaxing. Most importantly, the family wanted a unique space where they can practice golf in their free time. They were referred to Bella Turf by a friend, who was a previous client. Bella Turf and Greens offers clients detail-oriented installations for synthetic grass and putting greens. “When we install, we want to make sure we do a quality job,” Lopez says. “We make sure the seams are completely invisible and we make sure the turf is properly fluffed.” Bella Turf always puts their best foot forward when it comes to their artificial turf and putting greens projects. The company started in September 2017 and has been growing rapidly in the last year. Tony Lopez has over 10 years of experience in the artificial grass industry and has been leading Bella Turf and Greens in outstanding customer service and unique artificial turf installations. Bella Turf’s reputable service and quality installations are shown through 5-star reviews across the board on Yelp, Google, and Facebook. 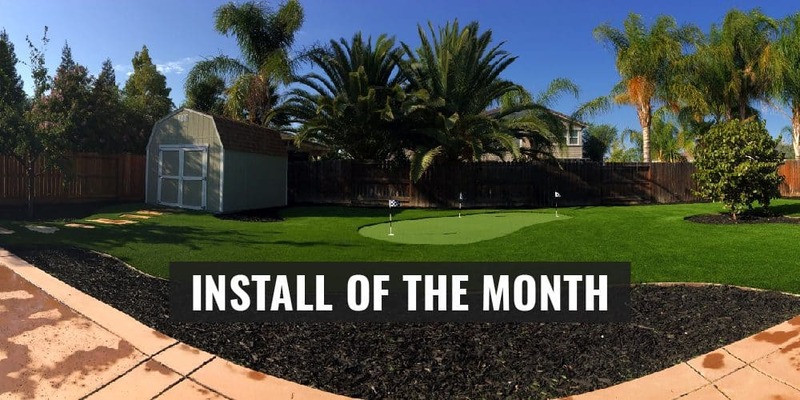 Bella Turf and Greens is Synthetic Grass Warehouse Install of the Month winner for September 2018.
https://syntheticgrasswarehouse.com/wp-content/uploads/2018/09/INSTALLofthemonth-03.jpg 500 1000 SGW Staff https://syntheticgrasswarehouse.com/wp-content/uploads/2018/03/sgw-logo-large-copy-300x120.png SGW Staff2018-09-18 09:30:232019-01-09 11:28:27Install of the Month: Bella Turf and Greens Inc.